Thai sticky rice is used all over Thailand in desserts (e.g. Coconut Sticky Rice with Mango) and also eaten with main dishes in northern Thailand. When eaten with a meal, small bites of this rice are grabbed with the fingers and combined with a small piece of a non-saucy main dish (e.g. larb), fresh crisp side vegetables (cucumber, lettuce, etc), or chili relish. Since this rice is traditionally eaten with one’s fingers, it is usually eaten with dishes that are solid and not very saucy; it shouldn’t be used to soak up sauces (so for example, it does not go with curry). This type of rice is called sticky rice, glutenous rice, or sweet rice. 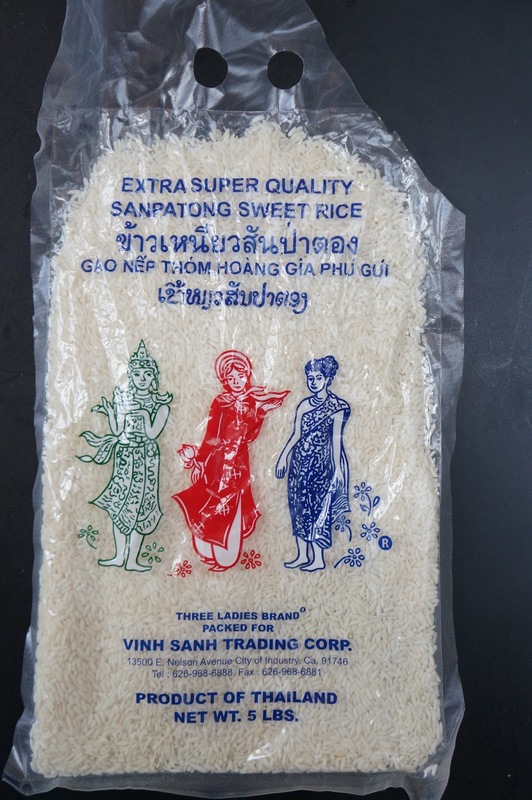 There are numerous cultivars of glutinous rice (including japonica, indica, and tropical japonica strains, see wikipedia), but the other types of sticky rice cannot be used as a replacement for Thai sticky rice (e.g. Chinese glutenous / sweet rice is something different). Milled glutinous rice is white and fully opaque when raw and slightly translucent when cooked (whereas non-glutinous rice which is slightly translucent when raw and opaque when cooked). Purple glutinous rice is also available; it is unmilled and its bran has a purple or black color; it is a different strain than white glutinous rice so it is not simply unmilled white glutinous rice. In order to ensure that you are buying the correct type of rice, make sure your sticky rice was grown in Thailand or Laos. If your package has Thai on it, you can also look for the Thai for word for this type of sticky rice, ข้าวเหนียว. Currently, I use the Three Ladies brand (pictured to the right) because it is easy to find in my area; Kasma Loha-unchit also recommends this brand (see her recommendations for brands). Making Thai sticky rice is extremely easy once you learn the technique. It is always soaked in water (preferably overnight, so it requires preplanning), and then steamed on top of water, never in water. 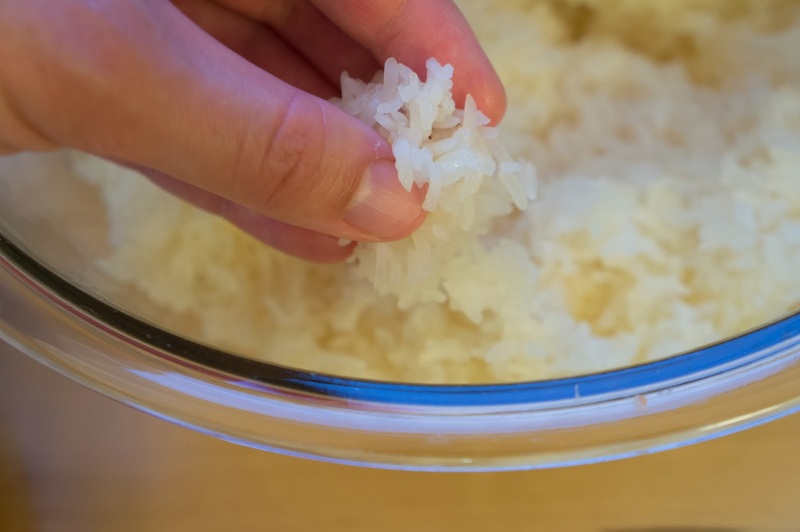 Unlike Chinese and Japanese rice which is both boiled and steamed, Thai sticky rice is never cooked with direct contact to water since this will make it mushy. You will need a steamer to make this rice. Traditionally, special Thai baskets and pots are used however many other types of steamers will also work for small amounts of rice (e.g. 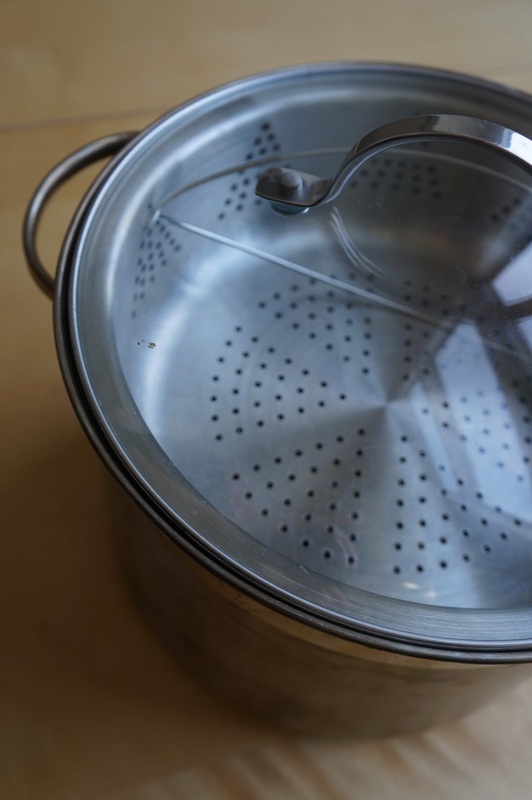 steamer insert, large metal sieve which fits in a large pot, or a Chinese bamboo steamer). You cannot use a Japanese/Chinese style rice cooker because it boils and then steams the rice (unless it has a steamer insert which allows the rice to be steamed on top of the water). I use a steamer with a metal basket (shown to the right; see here for an example of rice being steamed in my steamer). SheSimmers.com also has an interesting alternative steaming method which uses a frying splatter guard. The especially nice part about cooking this type of rice is that you don’t need to measure a specific quantity of water or rice so once you learn how to make it, you won’t need a recipe. You can make how ever much rice you need (within reason) as long as it will fit in your steamer and the layer of rice isn’t deeper than a few inches. The cooked rice will be a little bit more than double the size of the uncooked rice. I generally make 1 to 1 1/2 cups raw rice for two people for dinner; I’ll use the smaller amount if there are lots of filling dishes and the larger amount if the dishes are small. If I’m making rice for dinner and coconut milk Thai sticky rice with mango, I will usually make about 1 1/2 to 2 cups raw rice for 2 people and serve slightly less rice at dinner and use the rest in the dessert. There is some flexibility with the steaming time, though it will get softer the longer you steam it; it is done when you think it tastes done. You can also make Thai sticky purple rice; it should be marked as black sticky rice or “sweet rice” grown in Thailand or Laos. Since it is unmilled (“brown” or unpolished) rice, it takes longer to cook and is less sticky than white (milled) rice. Thus, a mixture of black sticky rice and white sticky rice is usually soaked and steamed together so that the final texture will be sticky. Often the mixture is half regular Thai sticky rice and half Thai black sticky rice, but my preferred ratio is 2/3 cup white sticky rice + 1/3 cup black sticky rice or 3/4 cup white sticky rice + 1/4 cup black sticky rice because I prefer the soft sticky texture of the white rice (the purple rice has a slightly crunchy texture). The two types of rice are soaked in the same bowl so that the black rice will dye the white rice, and then steamed the way normal Thai sticky rice is, except that needs to be steamed for 45 minutes or more. The resulting rice mixture has a beautiful and striking purple color after it is cooked. It is often used in Thai desserts (e.g. Coconut Sticky Rice with Mango). If you have left over cooked Thai sticky rice you can make Rice Cracker Snacks. SheSimmers.com has more information on sticky rice and lists how sticky rice is spelled in a few different languages. Kasma Loha-unchit has more information on this type of rice here. Source: Modified from a variety of sources, though my original source for the recipe was “Basic Sticky Rice” in “Hot Sour Salty Sweet: A Culinary Journey Through Southeast Asia” by Jeffrey Alford and Naomi Duguid. See also Kasma Loha-unchit’s recipe for Thai sticky rice. Plan 12 to 24 hours in advance so that you have time to soak the rice. Rinse as much rice as you want in several changes of water, until the water is mostly but not necessarily completely clear. Drain. Put it in a container that can hold at least 2 times the volume of the rice (I usually use the same container to wash the rice, but you can also use a colander to wash the rice). Cover with 2 to 3 inches of room temperature or cold water. Let soak for 6 to 24 hours at room temperature. If you forgot to soak the rice the night before and are in a rush, you can soak the rice in warm water (100 F) for 2 hours, however the longer soaking is much better since it gives the rice a more tender and even texture. Drain the rice. Be gentle with the rice at this point; the grains will have swelled and softened and may break if they are roughly handled. Don’t re-rinse the rice at this point, since this will break the grains and it tends make the rice mushy. Place the rice in a thin even layer in the steamer. The rice shouldn’t touch the water because water will make the rice mushy. The steam should be forced up through the rice. Try not to open the steamer very often since that will release the pressure, however if you do uncover it, wipe the condensation off the steamer’s lid before replacing it, in order to make sure that the condensed water doesn’t drip on the rice and make it soggy. Steam white sticky rice for about 25 minutes. **** Purple sticky rice needs to be steamed for 45 minutes because it is unmilled and thus takes longer to cook through. Taste the rice and cook a little bit more if it isn’t soft enough (be sure to wipe the condensation on the lid before replacing it). The rice should be soft but chewy, and the grains should be slightly translucent (if you are making white rice). When the rice is done, immediately put it in a dry basket or large bowl. ***** Remove and discard pandan leaves, if using. Use a large flat rice paddle or spoon to turn the rice over on itself to lightly break up any clumps. Shape the rice into an even round clump. To prevent the rice from drying out, keep the bowl covered with a plate; it will keep warm for at least 30 minutes covered, and can can be held at room temperature for at least a couple hours. Serve warm or at room temperature. Similar to many types of rice, soaking will help loosen bits of rice that are stuck to your steamer so that it is easy to scrub. Make extra sticky rice so that you can have Thai Coconut Sticky Rice with Mango for dessert. Dry leftover plain sticky rice in small clumps (they keep indefinitely) to make Fried Rice Cracker Snacks whenever you want. * Pandan leaves are sold either fresh or frozen, and they can be stored long term in your freezer. The frozen leaves that I have bought were lower quality than fresh leaves, since the frozen ones weren’t as long and had many breakages. If you can find them, it is best to buy fresh pandan leaves and freeze them yourself. Pandan leaves subtly flavor the rice and are desirable when the rice is being made for a dessert, but I find that the flavoring is too subtle to notice, but they are useful to help prevent the rice from sticking to the steamer and I like to use them because they are fun and easy to have around since they keep for a long time in the freezer. ** I find that the rice doesn’t stick too much to my steamer and doesn’t fall through my steamer’s holes, however if needed, you can use pandan leaves to partially line the bottom of the steamer (don’t fully cover it so that there is space for the steam to go through). Others have suggested lining the steamer with cheesecloth to prevent sticking; I find that this is usually unnecessary and I recommend avoiding it, since in my experience, threads from the cheesecloth tend to get stuck in the rice and the rice also tends to stick to the cheesecloth, though you can pull it off and pick out the threads. If you do choose to use a cheesecloth, rinse it with cold water (no need to squeeze it; you want it to be wet) before using it to line the steamer. 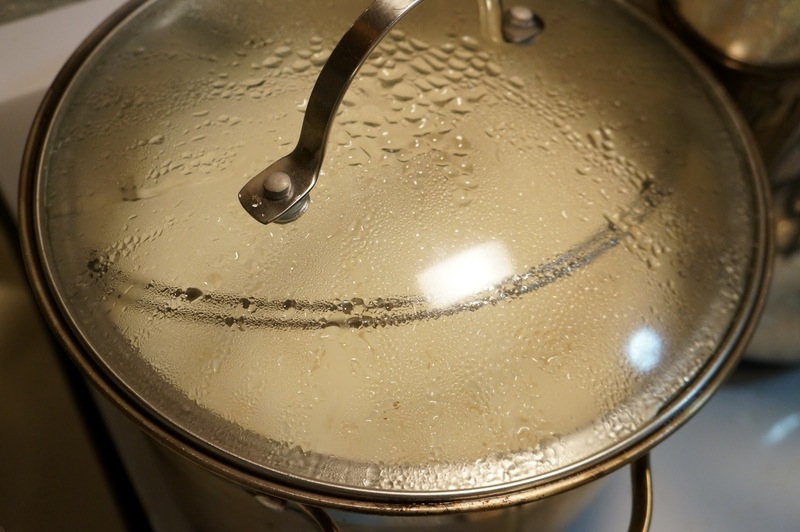 The cheesecloth has a tendency to dry out during steaming and this makes the rice stick to it, so wetting it first helps mitigate this problem. *** If the top of your pot clanks when steam is released or splatters water, then you can wrap a dish towel or piece of cheesecloth around the edge of the pot or you can drape the cheesecloth that you used to line the steamer around the outer edges of the pot if it is large enough (Paula Wolfert recommends this technique of using a large enough piece of cheesecloth to line and drape around the pot in “Couscous and Other Good Food from Morocco” for steaming couscous). 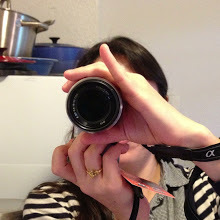 This will make sure that the top of the pot stays tight. I often don’t this, but on occasion when I’m cooking other things that are being affected by the splattering or if the clanking annoys me, I will use a dish towel. **** If you are steaming a lot of rice, some recipes advise that you can turn the rice over about 20 minutes after you start steaming, so that the top layer is on the bottom and vice versa in order to ensure that it steams evenly. With the quantity of rice that I steam, I find turning isn’t necessary and it is messy, awkward, and difficult, so I don’t turn my rice. ***** The only time this rice didn’t come out well was I left the rice in the steaming container after it was done cooking to try to keep it warm. Some water either condensed on it or fell on it from the cover and made it mushy. So don’t leave the rice in the container after it finishes cooking–immediately move it to a separate dry container, and keep it covered with a clean slightly moist dish towel so it doesn’t dry out and stays warm.